As if newborns weren’t edible enough on their own, along comes this insanely cute swaddling blanket that’s sure to send Baby’s yumminess factor skyrocketing. 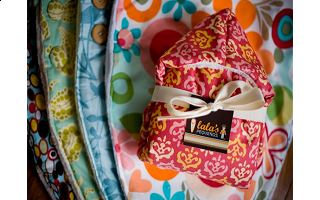 Sort of a cross between a sleeping bag, papoose pouch, and delicious fabric wonton wrapper, Lala’s Noonie creates an uber-cozy environment for bundling up a wee one. Created by Alessandra Gutierrez, who named the Noonie for her children’s favorite sleepy-time saying, this sweet blanket features a soft, organic, Minky lining while the outside layer buttons up to keep baby snuggly and warm. Made for swaddling (but not unsupervised sleeping), the Noonie comes in an assortment of gorgeous prints designed to delight. What a great accessory for very young babies who love to stay cuddled and comfy—this would make an utterly fantastic gift for any new mom. Warning: Using the Noonie in public may solicit gasps of admiration, declarations of baby-lust, and involuntary coochie-coochie-coo-ing. Hello to everyone in the Daily Grommet community! I developed this product because I wanted to give my friend, who recently had a baby, a gift that would keep her little one warm and snuggled while showing the baby off. I wanted it to be more than just a baby blanket, and I wanted it to be a gift that she would hold on to as a keepsake for her family. Named after my own children's word for "I'm sleepy, I want to go to noonie," Noonie is a wonderful cozy place, where you snuggle up and feel safe. So, the Noonie was born and has been keeping babies around the world warm and snuggly! I hope you love your Noonie as much as I love making them! I look forward to reading your comments and answering any questions you may have. I would like to send a Noonie to a friend who is having her first child this summer. Thanks! I would love this Noonie. My daughter is pregnant and I will be watching the baby 2x a week. I am trying to amass baby things to keep here in my home. It's a lovely prize. I am expecting my fourth child in October and would love to have a Noonie blanket making my child warm and secure and lets not forget Quiet!! lol Thank you! Absolutely precious! What great new baby gifts. My brand new nephew would be so cute wrapped in this beautiful blankie. What a cool product! My friend is expecting her first baby and I would love to get this for her for her baby shower--it will definitely stand out amongst all those burp cloths and blankets! After lots of help and trying...my brother-in-law and his wife are finally having their first baby in August. We're all so excited! I'm going to send them a Noonie now -- to hold and cherish -- as they await the arrival of their child. What a great idea! Just found out I am pregnant... a cuddly, organic swaddle would be a yummy treat for our little peanut. Plus the Noonie will make him/her the most stylish baby in town! What an awesome idea...very unique and snuggly too! Any baby would be delighted to have such a soft, snuggly blanket. Thank you for all the lovely comments and good luck to those who entered! Keeping baby warm and snuggly is so important in the first months of life. Cherish this time you have with them because they grow up so fast! This is absolutely precious! And what a darling model you had at your office!! A Noonie would be the perfect gift for my niece, who is expecting a baby boy in the fall. I know some mothers find it difficult to swaddle a baby with a blanket so this is the perfect solution. @Katherine, you are so right! Our model in the video was such a little starlet. I encourage everyone to watch the video for a quick dose of cuteness. Alessandra has created a winning product from all angles: quality, style and "awww"-factor. I have a 3 month old that loves to be cuddled up in a blanket. She would love the soft inside of the Nonnie and I would love to see the darling fabric! I don't have newborns anymore, but I took my babies' blankies and made them into wallhangings for their rooms. These noonies are gorgeous colorful designs. Once the baby outgrows the noonie, they would look great as a wall textile in the baby's room. I wish they were around when my tikes were babies! Great baby gift! I'd like to try the noonie with the new baby I am expecting, thank you! I tried a variety of swaddling blankets with my newborn, who happens to be a large baby. Most of them didn't work for him because of his size. This noonie looks like it would work for a larger baby, and, it's eco-friendly, snuggly, and stylish--what a great combination! Charlotte is adorable and quite the model and actress! Six weeks old and smiles on cue!!! The Noonies are adorable too! I was surprised at 20% going to the rain forests - the percentage is usually much lower. Kudos to Alessandra! Thank you for the opportunity to participate in this giveaway! They look great. It would be perfect for the new baby. This is adorable... and what a great gift idea!!! @Suanne Giddings, she is a perfect model for the noonie!! A smiley baby is a happy baby. The project we own is on the pacific side Costa Rica. It is called Rainmaker and it is a 1500 acre rain forest mountain. We have been taking care of it since 1993. It is a true gem in a world where our resources are being depleted at an alarming rate. I was lucky enough to receive a winter Noonie as a gift for my newborn in January and have used it nearly everyday of his life! Super cuddly, meticulously constructed, beautifully durable through machine washings and oh, so chic with the cute and trendy fabric print! I'm looking forward to adding a bright Spring print one for cuddling up in the stroller for walks in the park! @Diana--You are already being the dream aunt. What a lovely gift to give to this couple as they happily anticipate the birth of their dear baby. Noonies are soooo cute! I plan on buying one for all my expectant friends. Such a unique item for a baby shower gift! These are such gorgeous blankets! I would love to win one for my best friend. She'll being giving birth to her second child soon. These are adorable little baby pods. I'd love a Noonie for my daughter's best friend who is expecting her first baby soon. What a lovely blanket and a way to keep the baby comfortable and secure. I am so glad I found your site. My daughter is having a baby girl in September. I need to find cool clothes for her. The parents both compete in ocean events. So "Grommet" is a natural for the baby. Makes you want to have a baby again. All my expectant friends can expect to receive one. In a perfect world, the stork would make his delivery with the baby in a Noonie. Any chance of getting a matching bib in the same fabric as the Noonie? Best unique baby /shower present and probably wont be duplicated by any other guest. Very cute. Charlotte is adorable also. My son LOVED being swaddled - great gift idea for any new mom. a-dorable and perfect for wrapping up the little ones. 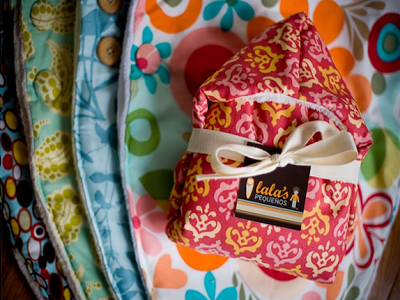 The fabrics are gorgeous and perfect for the modern baby. This swaddling blanket is absolutely adorable! I have given lots of these as gifts and the moms love them as do the babies!! Soooooo cute and unique! The Noonie is the perfect baby shower gift! Noonie now wishes that she can win a Noonie! As u can see I also am a lala its my grandma name and this is to freaky i was called noonie when i was a little girl. My cousins down the street gave it to me. I never told anyone about my nickname until now! Aside from that, I am getting one of your noonies as a baby shower gift. Was looking for something different .Don't know how I found you I guess from facebook. I find the nicest people there. @Marcia - we are so glad that you found your way to Daily Grommet! The coincidence with your nickname and the name of this adorable product is amazing. It will make a fabulous baby shower gift! My first grandchild is due in three weeks.. This is a great product, could have used it with my 5! 2 ? 's, 1- is the headpiece long enough for nursing mother's to cover to the shoulder with it? and 2- I want the polka-dots! but only see the flower and the animal print? @DiveDiva: Congratulations Grandma!! How exciting! The fabrics on the Noonies have gone through a line change and the ones in this video, first created in 2009, are no longer available. It is such a cute product with fun fabrics, that we simply couldn't take it off of our site. Regarding using this as a nursing cover, a nursing Mom's comfort level with coverage will vary from Mom to Mom. This would be enough coverage for some but not all Mom's. Thanks for your kind words about the Daily Grommet finds. Have fun with your new little one! 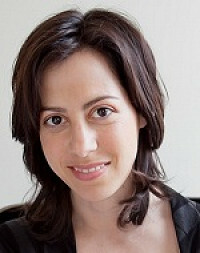 @Katherine Klinger: What fabrics are used in the Noonies now? @Margaret : The ones pictured below the video (currently only the Savannah) are the ones available. As if newborns weren’t edible enough on their own, along comes this insanely cute swaddling blanket that’s sure to send Baby’s yumminess factor skyrocketing. Sort of a cross between a sleeping bag, papoose pouch, and delicious fabric wonton wrapper, Lala’s Noonie creates an uber-cozy environment for bundling up a wee one. Created by Alessandra Gutierrez, who named the Noonie for her children’s favorite sleepy-time saying, this sweet blanket features a soft, organic, Minky lining while the outside layer buttons up to keep baby snuggly and warm. Made for swaddling (but not unsupervised sleeping), the Noonie comes in an assortment of gorgeous prints designed to delight. What a great accessory for very young babies who love to stay cuddled and comfy—this would make an utterly fantastic gift for any new mom.